As the long-anticipated Cotillion Ball approaches, debutante Rosemary Fitzpatrick’s fertile mind is about to land her in all kinds of trouble—with no way out! Rosemary’s debut at the ball is the last thing on her mind—because for the past few years, Rosemary, one of New York society’s beautiful young ladies, has led a double life as that of a dime novel author. In her wild west stories, her handsome hero, Harry Hawk, lives a dangerous life filled with unexpected adventures that her readers believe to be written by a man—F. P. Elliott. The catch is, so does her publisher. When Henry Cooper takes over the publishing enterprise in New York from his father, he insists on meeting with each author in person. Rosemary must protect her clandestine career by posing as the enigmatic author’s secretary. 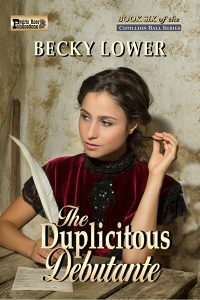 But during their meetings, Henry begins to fall in love with Mr. Elliott’s “secretary”, and her duplicity in their dealings begins to be a bigger burden than she ever imagined as she loses her heart to him, as well. When her deception begins to unravel at the Cotillion Ball, will Henry forgive her—or has deceit cost her the man she loves?